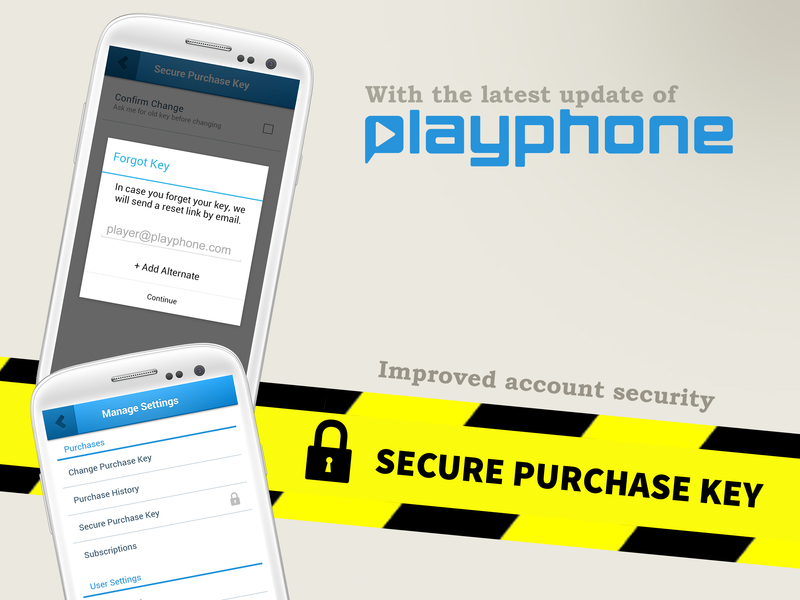 Exciting New Updates to PlayPhone’s Developer Portal! We are excited to announce our next round of developer portal updates! PlayPhone has worked long and hard to make our developer portal even better. First, we wanted to give you a bit of background. Until now, developers had no way of managing the status of their games (submission, canceling submission or un-publishing games). PlayPhone had to approve any and all changes. As PlayPhone’s developer network expands, this process became inefficient and was no longer the best solution. We decided to give our developers more options and control over their games and below is a full list of the latest update. We developed a new step-by-step wizard for setting up your games metadata, in-app products, leaderboards, achievements, promotional assets and application resources. 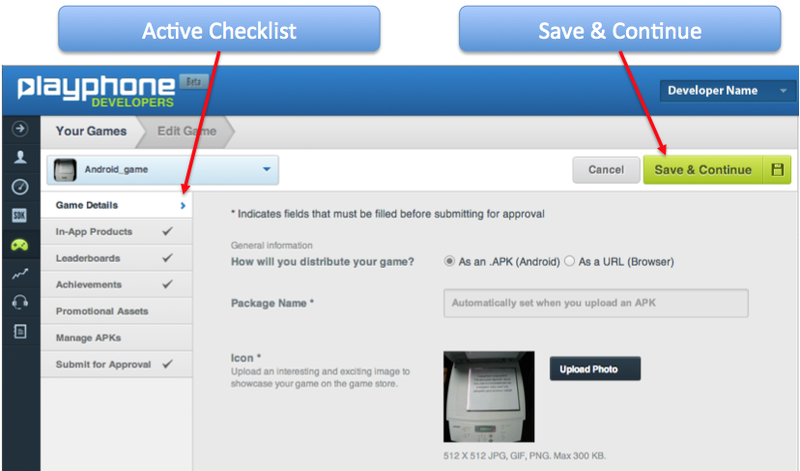 Use the active checklists to ensure all relevant sections have been completed for submitting your game for approval. 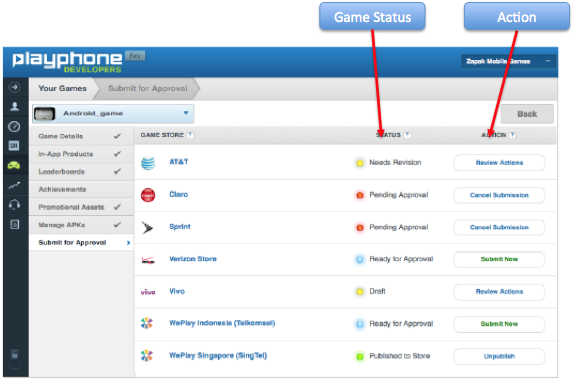 Quickly review the game status to know if your game is ready for approval, pending approval or needs revision. Your games are queued up for approval and publishing as soon as you submit it. We will send you continuous updates on the status of your game as it moves from testing to approval to finally being published on the Game Stores of your choice. Visit our dev portal, and let us know what you think of the changes! Forbe’s journalist Tom Taulli sat down with PlayPhone Founder and CEO Ron Czerny to discuss PlayPhone’s strategy and approach when it comes to mobile social gaming. This is the third time that PlayPhone has been featured in Forbes and we are excited that we got the opportunity to discuss our growth and the future of mobile. 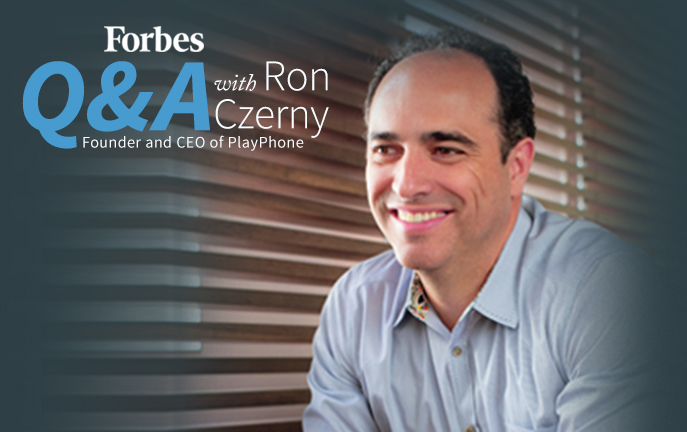 “I always look forward to speaking with Forbes and it is an honor knowing PlayPhone is speaking with one of the top publications in the world,” says Ron. To read the full Forbes article, click here. At PlayPhone, we are always thinking of new ways to protect our gamers and today, we are excited to introduce our latest security feature – Secure Key. Secure Key is a 4 digit number that players must enter prior to making purchases on PlayPhone’s mobile gaming network. This is for those players or parents wanting to protect their accounts even more. Players taking advantage of this feature can also secure their key by making sure that it can’t be reset without permission. When a player secures their key, they are required to enter the previous key prior to being allowed to change it. We also have a recovery mechanism built in that asks for an email address where we can send your pin for those times when you might forget. It’s just another feature that makes gaming with PlayPhone safer and easier for the family to use. Ron Czerny, CEO of PlayPhone and MEF North American Board Chairman, explains in the MEF MINUTE how the mobile gaming industry in North America is sure to become the biggest revenue maker for apps on mobile devices. In the article, Ron talks about how mobile phone users are becoming the consumers first screen wherever they are and marketers should be aware of the consumers in this market. The full article in MEF Minute can be found here. What is the best way of understanding and measuring game retention? Retention provides key information used in the optimization of your game. A recurring user gives you many opportunities to find the best configuration of game play, engagement, monetization, and more. High level retention stats, such as stickyness (DAU/MAU = engagement) can only give you a quick snapshot on how you are doing. While its a good, quick health-check, it is usually not deep enough to be actionable. In order to effectively measure retention and really make it actionable, you need deeper statistic capabilities, an understanding of your gameplay, and a bit of a curious mind. Of course you should be able to track standard usage metrics like DAU, MAU, and Time Spent (if you have the PlayPhone SDK integrated, you’re already doing this!) but additionally you should be able to track your own game defined KPIs, such as purchasing a certain item, reaching a certain level, connecting with a certain number of friends, etc. From there, you will want to be able to track cohorts, or blocks of users that fall into a certain category like ‘date acquired’ or ‘time since last play’ or ‘paying vs non-paying’, etc. Setup consistent analysis for each cohort over time, week over week or day over day (IMO a month is a long time in the world of game play and you can miss some important trends), to identify which users exhibit great engagement and retention, which ones do not, and what are the key differences between each cohort. Show me the week over week retention of all users who play in Easy mode vs Hard mode. Action: Maybe the game is too easy, people like a challenge, make it more difficult and compare a new cohort versus these 2 controls. Show me the week over week retention of users who came from AdMob vs InMobi. Action: Pay more per click where your better retention is to acquire more users. If you’re not capturing data in this format, its actually become somewhat trivial using a company like Mixpanel which tracks defined actions to give you solid funnel and waterfall analysis tools. If you have the inhouse capabilities, start with simple models (ex. DAU/MAU with weekly cohorts) to get your reports ironed out, and build from there based on business questions you want answered. Beyond that, don’t hesitate to reach out with questions! Let’s face it: app stores are crowded and it’s often a challenge to get your game noticed (unless you are lucky enough to go viral; but lets face it, you have a better chance of winning the lottery) and played by qualified gamers without having to spend a ton of money on acquiring users. Wide distribution is important, but smart distribution is even more important–getting your game noticed by the right people at the right time, and using word of mouth recommendations will help build awareness for your game. This is where PlayPhone can help; we are building the next-gen carrier-grade social games network. Partnering with leading global carriers, PlayPhone is powering their social games stores and linking them all to a global gaming network. Carriers are coming back in a big way and are ready to significantly impact the mobile gaming ecosystem. Here’s why. Back in the day when feature phones ruled, they were making a lot of money selling downloadable games and content on feature phones. With that revenue stream drying up, they realize that they need a next generation platform especially for games as at the end of the day that’s where consumers spend the most money in the application stores. Carriers control the end-to-end experience of their customers from the time they come into to the retail store to buy a phone all the way to what services they have access to on their phones and what makes their customers happy and loyal. They know that an engaging gaming experience is critical to their success. Focused on Games, Inherently Social. PlayPhone’s carrier games stores are app stores that are focused solely on games. Layered with social features, games stores empower friend groups to promote your game to all friends, pushing awareness and trial of your game to the right people and putting it on the path to success. Massive, new distribution. 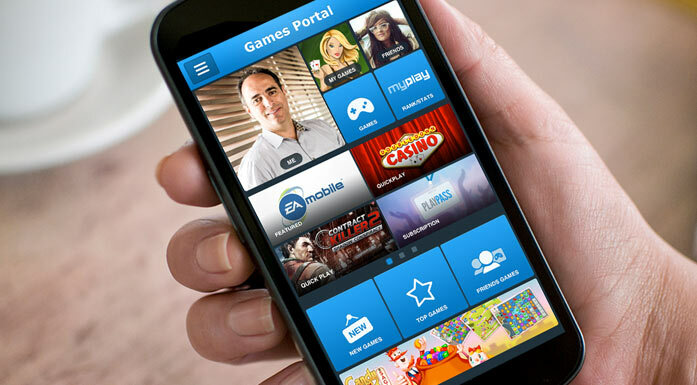 PlayPhone recently announced Games Portal on Verizon, and Ideias Social Games for Claro Brazil. Preloaded on millions of mobile devices, your game gets a massive new on-deck distribution channel. Look for more announcements to come soon. 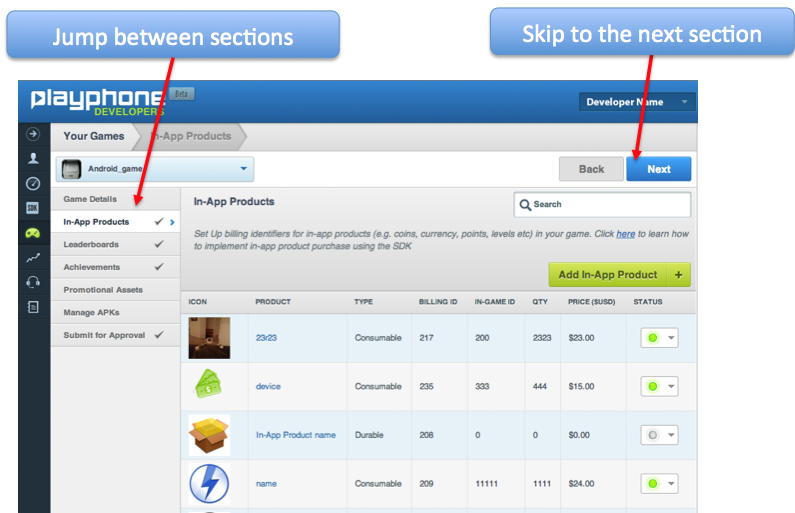 Monetize through one-time purchases and subscriptions. A key part of the PlayPhone platform is the billing engine that is integrated with our carrier partners globally. For the developer this means frictionless billing and for the user they can purchase games and virtual goods without having to ever take out their credit card. Any game purchase or in-game purchase appears directly on their phone bill. Best of all our single billing API supports all carrier games stores, Google Play Store and will soon support iOS in-app billing as well. So, you can just use our SDK to handle all your billing needs across carriers and application stores. In the world where users have multiple devices, the developers should have a choice to make their virtual goods the users purchase across all their devices. Cloud sync capability provides just that. All the virtual goods the user purchases can be sync’d to our cloud to enable access to them across devices. This is just the beginning. We believe that, in time, your phone loaded with social games stores is all anyone will need to play any game (Native, HTML5) with friends across all devices (Android, iOS). We are excited to announce that IGT?s wildly popular DoubleDown casino will be available on PlayPhone?s social gaming network this year. 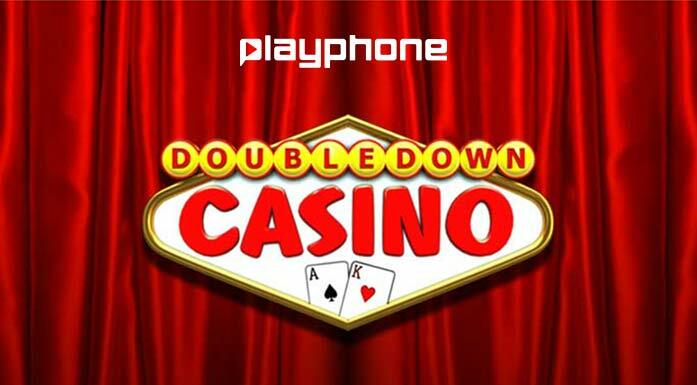 DoubleDown Casino is the largest free to play casino and brings PlayPhone gamers the full casino experience directly to their mobile phones. Acarus . Enjoy over 25 slot games, blackjack, video poker and much more! Try your luck today with DoubleDown Casino on PlayPhone?s mobile social gaming network. For more information about this partnership, please visit the Forbes article located here. Did you love watching Madagascar or How to Train Your Dragon? Well then PlayPhone has some exciting news for you! 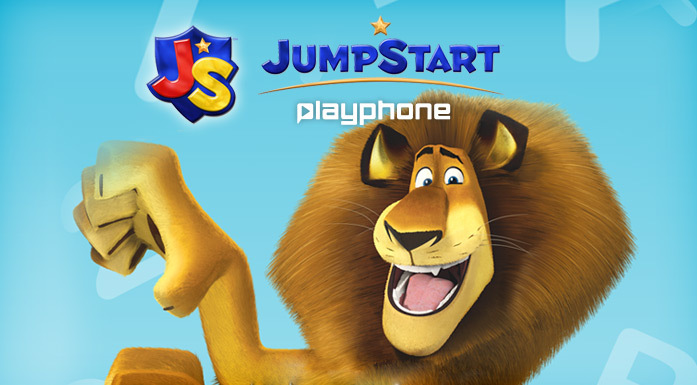 JumpStart is a leader in educational games and PlayPhone couldn?t be more excited to bring these games to our gaming network. Try out JumpStart?s games today or for more information, click on the links below. Let us know your questions and comments. Greetings and welcome to PlayPhone?s new Blog. We?re excited to share our thoughts with you on the current and future states of the mobile social gaming industry and PlayPhone?s role in this dynamic category. And since we?d like this to be a 2-way discussion, we welcome your comments as well. You may have heard our recent announcement about the upcoming launch of Games Portal on Verizon?PlayPhone?s new mobile social gaming destination for Verizon customers. 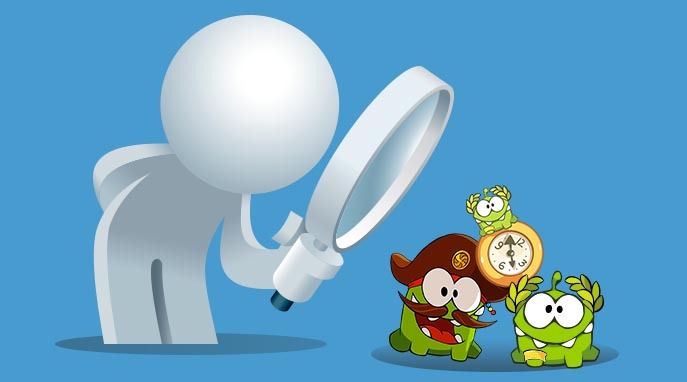 Preloaded on millions of Android devices, Games Portal is Verizon?s socially powered games app store that connects Verizon subscribers to a global gaming community. With deep social features interwoven throughout the gaming experience, we think it?s a fantastic opportunity for game developers to access a major new distribution channel and tap into the powerful monetization and marketing opportunities of a premier global carrier. We?re also excited about the content coming to Games Portal and would welcome the addition of your game. 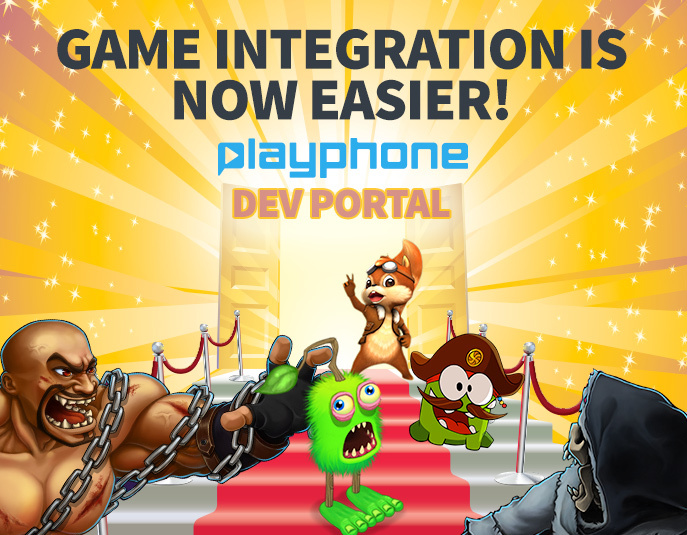 It?s easy to integrate your game because of PlayPhone?s single integration SDK. To find out more about PlayPhone?s developer program or to be a launch game for Games Portal, visit developer.playphone.com. And Games Portal is just the beginning. We are anxiously awaiting the upcoming launches of PlayPhone’s social gaming network with more top global carriers over the next year and I’m glad you’ve decided to join us for the ride. This will be the first of many blog posts that will detail PlayPhone and what it is like to run a world-class mobile social gaming company at a crucial time in the evolution of mobile gaming. Before I go into PlayPhone any further, I?d like to give you a little background about me. My name is Ron Czerny and I am the Founder and CEO of PlayPhone. I?m a long-time gamer and have always had a passion for web and mobile games. I sit on the board for the Mobile Entertainment Forum, founded the Brazilian Video Game Association (did I mention that I?m from Brazil?) and headed Capcom?s video game strategy and distribution for Latin America. If you’re interested in learning a little more about my background please visit here. Lastly, I’d like to welcome you to PlayPhone?s new blog and I look forward to interacting with you all. As founder, Chief Executive Officer and board member, Ron Czerny serves as the visionary and driving force behind PlayPhone's corporate strategy. Czerny's more than 18 years of experience in the games industry has allowed him to help establish PlayPhone's dominance in the mobile social games industry and position the company to compete and thrive on a global scale.